Before Taylor's diagnosis, she was really struggling with her skin. We could not figure out what was causing such severe acne, rashes, psoriasis. I was desperate, trying to help my daughter. We went to a Holistic Organic Esthetician. She mentioned it was most likely a combination of both external and internal issues and it was the first time I heard about the gluten possibly being a problem. Now that we know a huge majority of the issue was wheat, my daughter now has a clear face. Still, it is hard to find gluten free products for the face and body. So many over the counter products have hidden gluten. If you did not see my previous post on this, please read about it HERE. I give a list of all the hidden names of ingredients that have gluten. 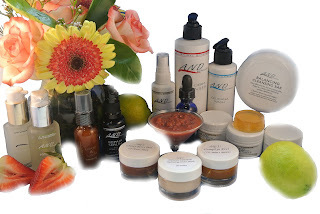 I am so happy that the same Holistic Organic Esthetician that helped my daughter, Monica, has a product line of gluten free Natural Organic Skincare Products. You can view her products HERE. My favorite product is her peel and mask facial kit. I also love the Glycolic Kit. My daughter and I use the Glycolic kit every day. I am happy to rave about this product. Instead of having to pay hundreds of dollars now, we are able to do it at home. I can relax knowing all of the products are gluten free and safe for my daughter. 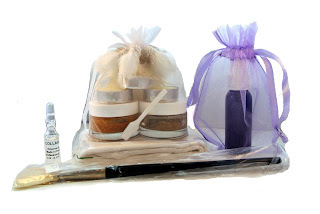 Please check out her site http://www.monicasperfectbeauty.com/ If you sign up for her FREE newsletter she will send you a FREE pumpkin toner for you to try. She is now offering her knowledge and expertise free online. SO many Celiacs don't realize they have to worry about it being in their lotions, Soaps, Shampoo, and makeup. Please read the forbidden ingredient list HERE if you are not aware of them. This is nice post. It's give some well idea to use a different types of Natural Organic Skincare Products. I also accept this suggestion. Obliviously it's right to use a natural product. It's not harmful our skin and well effect on our fairness.